At Thorson Dentistry, we’re proud to be celebrating our 1-year anniversary serving the wonderful youngsters of St. Charles, St. John and St. James Parish. It’s been our joy and pleasure to work with your incredible kids and we appreciate your continued support. It means the world to us – and we wanted to find a way to thank you. That’s why we’re planning a 1-year anniversary GRAND OPENING on Saturday, March 21 from 12pm-3pm at our dental practice at 159 LONGVIEW DR. STE. A DESTREHAN, LA 70047. 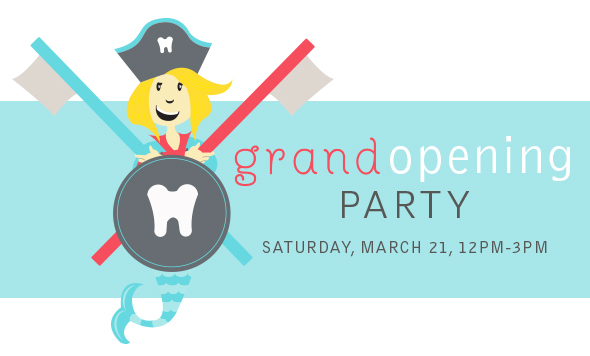 All patients and parents are welcome to stop by for party favors and tooth-healthy drinks and snacks. Remember, our 1-year anniversary open house is Saturday, March 21st from 12pm-3pm at our dental office on 159 LONGVIEW DR. STE. A DESTREHAN, LA 70047. For more information, call us at 985.307.0072. Dr. Thorson and all of our staff would like to say again, “Thank you!” for making our first year in the area so terrific. Honestly, we couldn’t have asked for better!